Camping & Village Rais Gerbi es un camping en Finale, Palermo, situado junto al mar. Este camping en terrazas tiene plazas con cercos y con sombra. Camping & Village Rais Gerbi se encuentra junto a una playa de piedras. Cabe alquilar caravanas fijas y bungalós. El camping dispone de parque de recreo y de terreno de deportes. Para los excursionistas, el camping ofrece programas de excursión. Hay un programa de animación. El camping dispone de una piscina descubierta. En los alrededores, podrá nadar en el mar. En el Camping & Village Rais Gerbi se autoriza el buceo, windsurf y el descenso de ríos/kayak/rafting. No tendrá que cocinar todos los días, porque en el camping hay pizzería y restaurante (con una amplia oferta). En el camping podrá adquirir pan fresco. Es posible utilizar el internet, pues el camping dispone de uno o de varios ordenadores con conexión a internet y en el 80% del camping se puede navegar por internet con el ordenator portátil. Este inspector visita cada año al Camping & Village Rais Gerbi y lo inspecciona considerando más de 200 servicios y otros aspectos importantes. El inspector es un trabajador de ACSI y no trabaja para el camping. Enzo took us to the train station for our trip to Palermo, and even though our return trip on the train was a complete disaster, he willing collected me from one station, and my husband from another, fairly late at night!!! We enjoyed a lot this camping place. We arrived super late and they were very nice and welcoming despite the late hour. With a tend, they recommended us to stay near the beach. We stayed in a beautiful platform by the sea and enjoyed a peaceful night there. Cleaned toilets and nice environment. Totally recommend. One of the best we stayed at. Friendly staff, good facilities, great views. A great place to relax. Fresh bread in the morning or a short walk to town. One of the best Pizza in Italy can be bought at the restaurant on site..
We stayed for 1 night during a road trip mi-sept. We had a spot with a tent on the terrasses in front of the sea, absolutely beautiful. A beach is just down the terrasses so you can have a swim very easily, there are trees, an amazing swimming pool, and the coffee is good at the bar-restaurant. The site is dissected by a railway line and the access to the small stony beach is down long flights of steps. Pitches on concrete, with no privacy. WiFi free for one hour on arrival, after which the tickets are expensive. Village of Finale only 500 m away, but along a busy road - not accessible along sea shore. Very basic shops. Camp facilities old but functional. Restaurant closed. Washing machine OK, but no drier. The owner was very aggressive when asked about the metered electricity, as we were paying the ACSI Card rate. He refused to explain what was included, or the price per kWh if we exceeded the limit, and asked if we were so poor that it mattered to us! Next day a friendlier Receptionist said 3 Euros' worth per day' was allowed but we must pay for any extra. When we left, however, no-one bothered to read the meter and we were not charged extra - so why the insults? We will certainly not return here. The campsite has a lovely private beach and garden. They were all very friendly and my dogs welcomed and free to play around and swim. The viewing was stunning. We spent 8 days with our trailer. Our campsite was perfect with a beautiful view to the sea. Very clean & the trash is taken away every morning. The owner and his staff our very friendly and helpful. Our return trip to Genoa was cancelled. They called free of charge and rebooked our trip home. The restaurant is very good and not to expensive. The camping is very well located for side trips. In the small town of Finale (10 min on your bicycle) you will find everything you need. Very clean, also nice for a beer. One of the top 3 campgrounds we have been in since leaving Canada. Great staff and management, very helpful and smiles all the time. The pool is one of the highlites of the campground... salt sea pool water very clean and refreshing. The pitches most if not all have amazing views of the sea. Strong power and water pressure. Will go back.. in fact we are going back before we catch our ferry. Perfect location for those who are catching ferries off the Island of Sicily! Thank you a wonderful stay..
¿Desea reservar u obtener más información sobre su Camping & Village Rais Gerbi? Puede hacerlo mediante los datos siguientes. A20 hacia Messina, salida Tusa, SS113. Izq. hacia Palermo. Desde dir. Palermo, salida Castelbuono/Pollina hacia SS113 (costera) y allí a dcha. Está en el km 172,9 de la SS113. 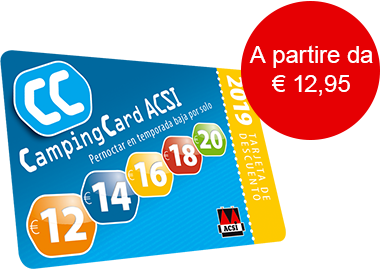 ACSI Eurocampings reenvía su solicitud de información al "Camping & Village Rais Gerbi".